As new revelations about America’s electronic surveillance efforts continue to emerge, a new Pew Research Center survey finds widespread opposition around the world to U.S. eavesdropping. Still, America’s overall image remains mostly positive. At the same time, however, people see the global balance of power shifting, with China on the rise, and the U.S. in relative decline. Here are five key takeaways on how the world views the U.S., China, and the superpower competition between the two major rivals. 1People around the world don’t want the U.S. eavesdropping on their leaders or their citizens – or for that matter, on American citizens. In nearly all 43 countries surveyed outside the U.S., majorities say the U.S. shouldn’t intercept communications from foreign leaders or foreign citizens. 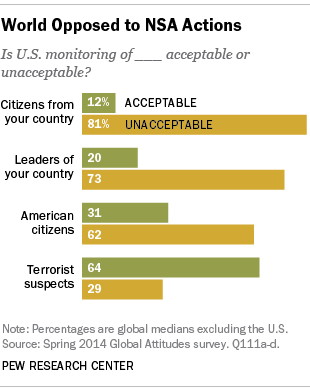 And most tend to believe the U.S. government shouldn’t listen in on American citizens either. Moreover, the revelations about U.S. spying by former National Security Agency contractor Edward Snowden seem to have had an impact on America’s reputation for respecting individual liberty – in 22 of 36 countries polled this year and last, fewer people now believe the U.S. government respects the personal freedom of its people. 2 They don’t like drones either. In 39 of 44 countries, a majority or plurality oppose U.S. drone strikes against extremists in countries such as Pakistan, Yemen and Somalia. In 27 nations, at least seven-in-ten disapprove of drones. The only three countries where at least half support drone strikes are Israel, Kenya and the U.S.
3Still, the U.S. remains largely popular around the world. Across 43 nations, a median of 65% express a favorable opinion of the U.S. The U.S. gets its highest ratings from a diverse set of countries: the Philippines, Israel, South Korea and El Salvador. Views remain overwhelmingly negative in several predominantly Muslim nations, such as Egypt, Jordan, Pakistan and Turkey. Meanwhile, the U.S. has a more positive overall image than its main geopolitical rival – a median of just 49% give China a favorable rating. 4 But global publics tend to believe that China will surpass the U.S. to become the world’s leading superpower. 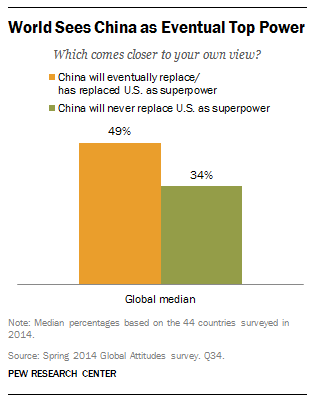 A median of 49% say China will eventually replace or has replaced the U.S. as the world’s leading superpower ; 34% disagree. This view is shared across all regions surveyed – Europe, the Middle East, Latin America, Africa and Asia. This is especially true among some of America’s top European allies. Across the seven European Union nations polled, a median of 60% think China will or already has replaced the U.S.; only 33% say this will never happen. 5	Many in Asia worry that territorial disputes will lead to conflict with China . The rising power of China generates anxieties among its neighbors. In particular, there are widespread concerns that the many territorial disputes between China and other Asian nations will lead to a military conflict. More than eight-in-ten hold this view in the Philippines, Japan, Vietnam and South Korea. Two-thirds of Americans and 62% of Chinese also say they are concerned. Our new interactive shows global opinion on U.S. electronic surveillance programs.